I love stargazing, and one of the great treats for any stargazer is a meteor shower. Peaking late tonight and early tomorrow morning, the Perseids are one of the most reliable meteor showers, and they occur at a time of year when the weather is generally most conducive to sitting outside and watching. Unfortunately, in my neck of the woods in Phoenix, Arizona, it looks like we’re going to have a cloudy, rainy night for the show this year. In any event, a nearly full waning gibbous moon would make watching difficult, because the bright moonlight drowns out much of the show. However, I thought I’d share some stories from my experiences of Perseids past! Living in the heart of Phoenix, now the 6th largest city in the United States, automatically makes it difficult to view meteor showers here. The pervasive city lights drown out nearly everything. Luckily, much of Arizona is less developed, so one doesn’t have to travel too far to find dark skies. The earliest Perseid shower I recall was probably when I was 10 or 11 years old – my parents packed us all into the car after sunset and we drove up the Interstate 17 freeway to the Carefree Highway turnoff. Although now that area is very built-up, in those days (about 25 years ago) that was the middle of nowhere. I remember there being many other cars stopped out there, all with the same intentions of viewing the meteor shower. This was also the first time I ever saw the Milky Way Galaxy, splayed across the sky. I don’t actually recall seeing any meteors that night, but I’ve since learned that the best time to view meteor showers is actually in the hours before dawn, when the radiant is highest in the sky, not just after sunset. My family used to take trips up to Flagstaff in the summer. Flagstaff is a city in northern Arizona, approximately 150 miles from Phoenix. It is renowned for its dark skies, and in fact, Lowell Observatory, where researchers first discovered Pluto in 1930, is located there. In spite of the impressive dark skies within the city, we would often awake early in the morning and head out on the highway in search of an even darker turn-off. One highway exit that we pulled off at seemed perfectly dark and we turned our eyes skyward only to be absolutely startled by a noisy, bright freight train chugging by, mere feet away from us. After the disruption of the train, everything quieted down and we were able to view a few meteors. But we weren’t really prepared with the proper comforts for our excursion and left after only 30 or 45 minutes of viewing. That’s another thing that I’ve since learned – make sure you’re comfortable for a meteor shower! Bring chairs, blankets if necessary, food and drinks … all of these will make you want to sit out there longer and thus have a better chance of seeing more meteors. In recent years, I’ve gone on Perseid-watching trips with a friend of mine. We used to work the graveyard shift together, and since the Perseids peak occurs in the slower summer months, we were able to wrap up our work early and head out on the highway. I’d pack hot cocoa and a picnic breakfast and we’d leave Phoenix and drive about 50 miles north out of town, pull off the highway, take out a couple of camp chairs and blankets and settle in for a few hours of viewing! It was always very exciting – and our preparation and patience allowed us to see some great fireballs! 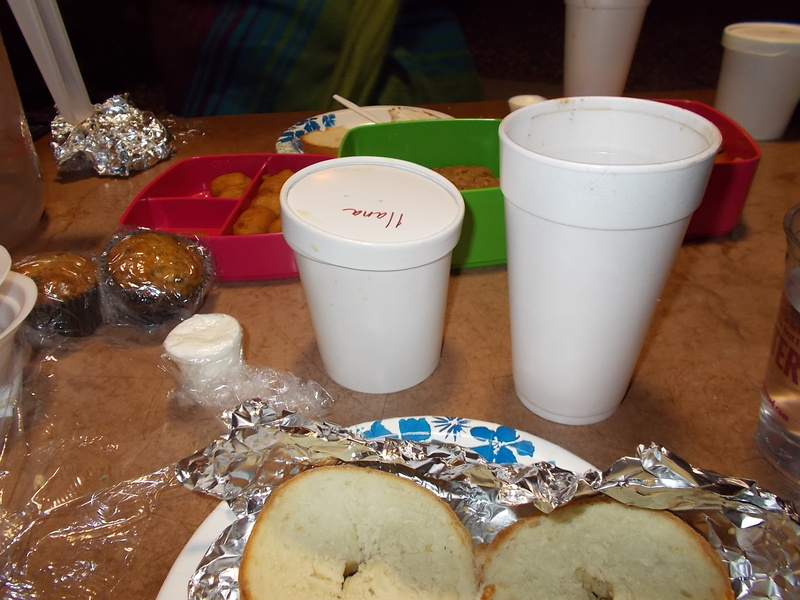 When the bluish fingers of dawn started rising in the East, we would get back in the car and head back toward Phoenix, stopping at the Sunset Point rest area for a breakfast picnic, often with homemade bagels, lox and cream cheese, and, of course, the hot cocoa! Wrapped in our blankets (it’s chilly up there in the early morning hours, even in August) we’d watch the sun come up and drown out the last of the meteors. It was always such a fun and memorable experience – and time spent with a good friend is always rewarding. I’m not a skilled astronomical photographer, so I don’t have meteor pictures, but I’ll share some picnic pictures from years past! 2012 Perseids – That’s me standing in the darkness, a blanket about my shoulders, trying to catch the last few visible meteors before the sunrise. 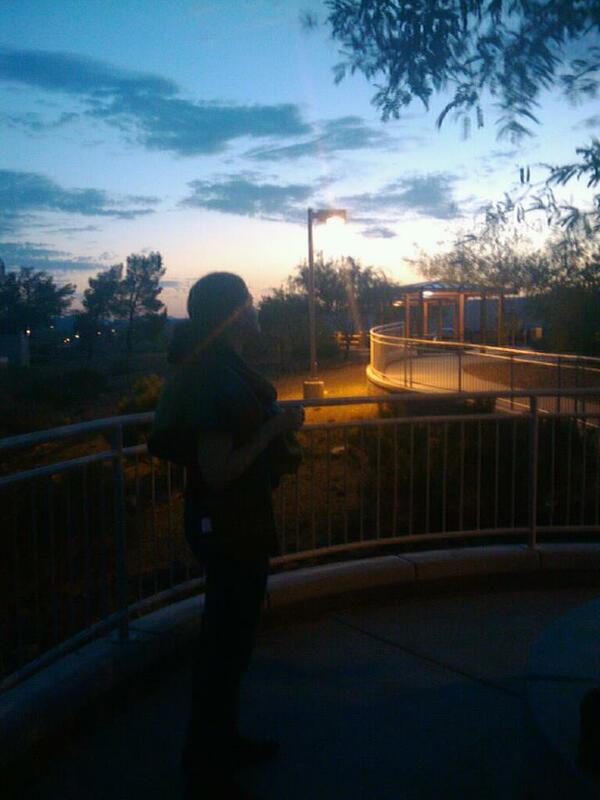 2013 Perseids – Picnic time at Sunset Point! 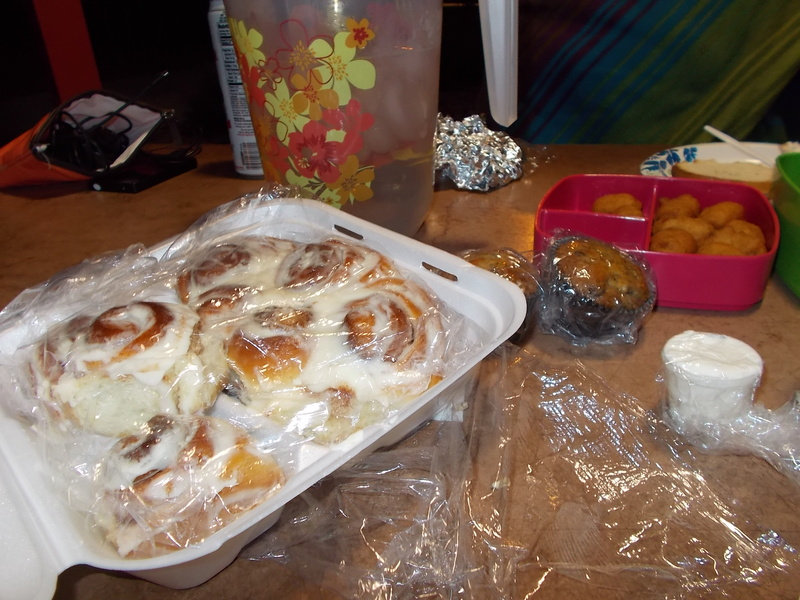 2013 Perseids – We had cinnamon rolls at our picnic, too! 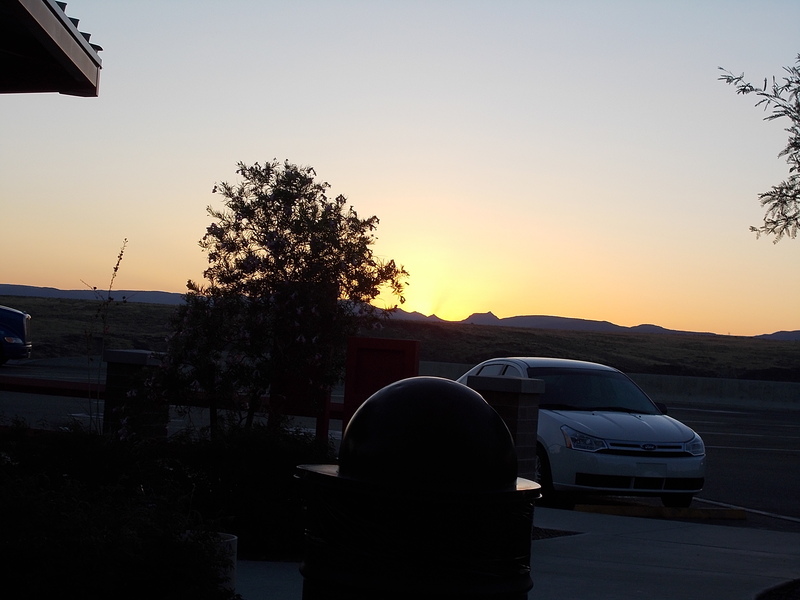 2013 Perseids – Sunrise at Sunset Point Rest Area. I encourage you to create your own memorable meteor shower excursions with your families! If weather permits in your area, and you’re in the northern hemisphere, give a shot at viewing this phenomenal natural show – it’s a great opportunity to spend time with your kids and teach them about the wonders of space – even if you just step out into your own backyard! If you’re new to stargazing, Space.com is a great resource for learning more about the Perseid Meteor Shower, as well as other news and information about space science and events!